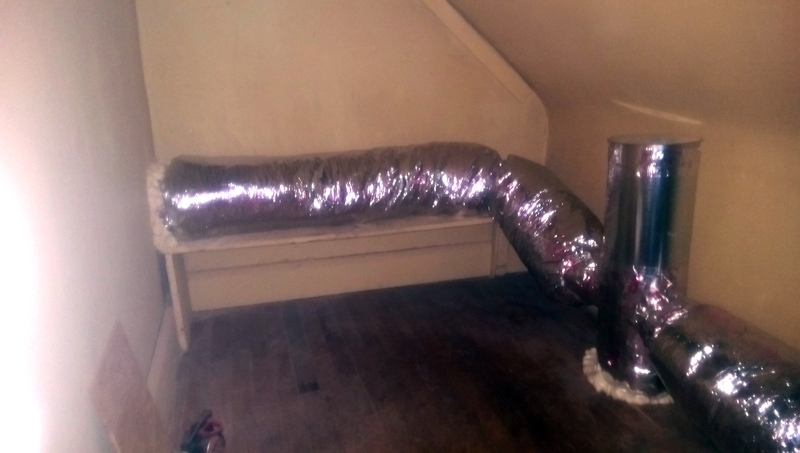 A new homeowner in Saint Paul hired Mill City Heating & Cooling to run new Ductwork for their unheated bedroom and bathroom on the second floor. Mill City Heating & Cooling was also hired to install a new Furnace and Air Conditioner. The old Victorian Saint Paul house had been converted from a boiler and radiant heat system to forced air in the 1960s but ductwork was not run to the room as they were much more difficult to run, air conditioning in residential homes was uncommon and the contractors new that warm air would rise to heat the unheated rooms. Unheated rooms are not uncommon in homes that were converted to forced air in the 60's and 70's as running new ductwork is often much more difficult in an existing finished house rather than during construction.. With a little ingenuity Mill City Heating & Cooling was able to provide ductwork to the second floor bedroom and bathroom. The New Furnace and Air Conditioner in this old St Paul Home will ensure comfort for the new homeowners for years to come.